You'll be £8.00 closer to your next £10.00 credit when you purchase Fixer and Fighter. What's this? Hubert de Burgh rose from obscure beginnings to become one of the most powerful men in England. He loyally served first King John and then the young Henry III and played a crucial role in saving the Plantagenet dynasty when it was at its most vulnerable. During King John’s disastrous wars in France, Hubert held Chinon castle against the besieging French for a whole year. He remained loyal when the Barons rebelled against John and, when they invited French invaders to intervene, Hubert successfully held Dover Castle for the king against a siege led by the French Prince Louis. After John’s death, he held it for the new king, 9-year old Henry, against a renewed siege. In August 1217 he struck the final blow against the French invasion, which still held London, when he defeated a powerful fleet carrying French reinforcements at the naval Battle of Sandwich. Hubert continued to serve Henry III, making important reforms as Justiciar of England and leading military campaigns against the Welsh Prince Lewellyn. He eventually lost favour due to the machinations of his rivals and narrowly avoided execution but was eventually reconciled with his king and able to die a peaceful death. Incredibly, this is the first full-length biography of this remarkable man. This is an excellent, and well-researched book which makes a good argument for the importance of an almost forgotten historical figure. This is the story of Hubert de Burgh, Earl of Kent born about 1170 into a family of East Anglian land owners. His biographer vibrantly concluded that 'Few, if any statesmen in the last one thousand years can claim his example of outstanding personal dedication and heroism in the service of his country.' A powerful claim indeed, but reading this book you will find it a claim well justified. ...this is an excellent biography of a key figure in English medieval history, tracing Hubert's career through some of the most turbulent periods of English medieval history. I admit that I had never heard of this man, whose abilities and achievements were so extraordinary. This enjoyable, and interesting book filled that void. This book is the first popular biography of Hubert de Burgh, one of the most prominent men in England during the turbulent reigns of King John and Henry III. This book is a good read, even for those hazy about the twelfth and thirteenth centuries. A truly remarkable man, a great justicar, and fiercely loyal to the crown. This remarkable book is well worth reading. The superb cover alone of this book would make one want to look inside, and what a treat is in store for the reader! The author, from the start has you looking over the shoulder of 15 year old Hubert de Burgh as he enters London after almost a week's trec from his family home in Norfolk, to take up a junior post at the King's court. His elder brother William, a prominent civil servant, had got him this job and we follow him along the route he would have taken from his first night's lodgings, near Aldgate, to Westminster.by boat from Queenhithe. Brian Harwood's descriptive passages of this first journey to his new life through the back streets, and on the river, gives one a real picture of the smells and sights of mediaeval London. Throughout Hubert de Burgh's life the reader is kept watching over his shoulder from his lowly start to becoming Justiciar of England,.ending with his death at age 73 in his own home at Banstead. For servces to King and country, at home and abroad, he is made Earl of Kent. 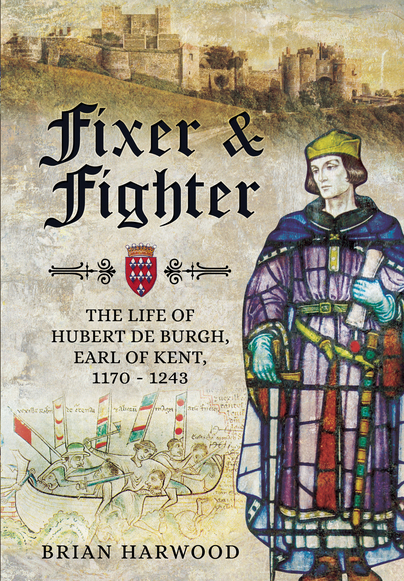 The title of "Fixer and Fighter" in three words sums up Hubert de Burgh; a most able communicator "fixer" for his Kings, Richard the Lionheart, John and Henry 111 during the violent times of the 12th/13th centuries, and as a fearless "fighter" at home and overseas. A most entralling read about a figure in history of whom I knew nothing beforehand! Brian Harwood spent his 15 years as a soldier in a Guards regiment researching and writing the first history of the Horse Guards building in Whitehall. Now in his eighties he lives in East Sussex where he continues to write and research.